Hadi is not an ignorant illiterate. His views are shared by many others, not all of whom are rural and less educated Muslims. He is more educated than most of his generation, including most of your fathers. REALLY? TGHH (Tuan Guru Haji Hadi) may have views that you do not like, but he is not an ignorant illiterate. His views are shared by many others, not all of whom are rural and less educated Muslims. He is more educated than most of his generation, including most of your fathers. What’s wrong with the statement that the majority must rule? Is not that what parliamentary democracy is all about? The rule of the majority? Or you wish for the dictatorship of the minority, as someone observed prevalent in the Arab world? And judging from the language they use, many if not all of his detractors here seem to be ill educated urban roadside ruffians. Musang McHassan (MM) asks “What’s wrong with the statement that the majority must rule?” Is not that what parliamentary democracy is all about? Yes MM, in its raw form, that is what parliamentary democracy is all about. But parliamentary democracy is NOT about political hegemony – the dominance of one group over another. Do not just look at what “rights” parliamentary democracy confers upon those elected to do government….why not look at what “responsibilities” are conferred upon those elected to office in a parliamentary democracy. The right of Malaysians to question why/how and for what reason, RM2.6 billion was deposited into najib razak’s personal account. It is about the government responsibility to explain to the people why the United States Department of Justice is seeking to recover more than $1 billion obtained from corruption involving 1MDB on behalf of the Malaysian people – why is the US DOJ doing this? Why is this not being done by the Malaysian Government? It is about why the BN Federal Government has not given Kelantan the oil royalties it is entitled to. And in a small way, it is about why bloggers like me have to write what we write about the abuse of parliamentary democracy not from Bangsar but from outside Malaysia. The tyranny of the majority over the minority is just as odious as the dictatorship of the minority over the majority. Tyranny of any sort by anyone over another human being no longer has a place in the world. You said that this Hadi is not an “ignorant illiterate”…far from it, he is said to have more guile, education and brains than aruah TGNA. Really? Is that is why Hadi is now presiding over a PAS that has seen thousand leave to join Amanah? Is that why PAS is today “negotiating” with unmo and the opposition for an “arrangement” that would be politically advantageous for PAS? And in the process everything is negotiable – from RUU355 to the distribution of “dedak” among PAS political elites. Is that why aruah TGNA was revered and respected as a leader of PAS . While Hadi is a an object of contempt and fun! And this is what MM also tells us this about Hadi : “His views are shared by many others, not all of whom are rural and less educated Muslims. He is more educated than most of his generation, including most of your fathers”. Yes my dear MM…this is what worries me….that there are many Malays/Muslims who share your views about Hadi for all that it tells me is that we Malays have still much to learn from the other races. There are many Chinese who have given hundreds of millions of Ringgits to help Chinese children have a decent education….but these same Chinese who give their millions to help these Chinese students to have a decent education DO NOT ask for the contract to build these schools, do not ask for the contract to supply school books, computers nor do they ask for the contract to supply the school uniform, shoes or school bags that these Chinese students will use. There are many Indians who donate to build Temples and to feed the poor Indian families who live in much poverty but these same indians do not ask for the contract to build these Temples nor do they ask for the contract to supply the beras, gula or any other food that is being bought with the money that they donate. Umno give all these things to the Malays – education, food and whatever the Malays might need for the education of their children and food and shelter for their life – but umno wants the contract to build these schools, supply the text books, the computers, the uniforms and the shoes and anything else it is buying for the Malays and the other races….and all these contracts are given out to umno’s people at exorbitant hike up prices to allow these umno contractors to make their dedak at the expense of Malaysians everywhere! So yes there are still many Malays – rural and educated Malays – who share the views of Hadi. Until they realise what damage is being done by umno and Pas to the Malays, to Islam and to our people and our country at large, we Malays and Muslims shall forever remain “little” people, with “little understanding” or how “little” we are held in the eyes of other Malaysians and the world for being unable to understand that the world around us is rapidly changing while we continue to live in a world where people like Hadi are held in high esteemed by people like you. Nobody owes us Malays and Muslims a living. Nobody will keep stopping and keep picking you up as you keep stumbling and falling because of the racial and religious ropes that are tied around your ankles. We Malays and Muslims need to break free from the shackles that people like Hadi imposed upon us because politically they need to shackle us to prevent us from straying too far from their side. But I dare say this….there are more Malays and Muslims today who no longer want Pas…no longer want Hadi than there are Malays and Muslims who want Pas and Hadi. 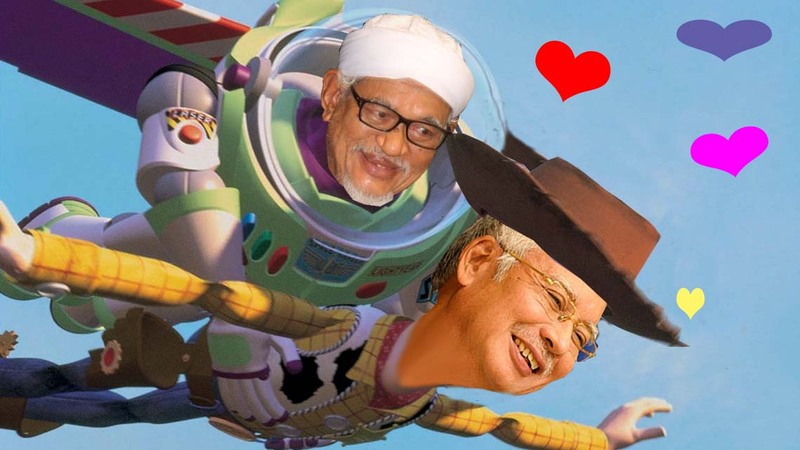 That is why Pas is in government only in Kelantan.That is why Hadi is seen by many Malays and Muslims as an object of mirth and fun rather than a religious scholar trying to do politics….and in trying to be master of both, he is master of none. By Hussein Abdul Hamid|2018-07-14T06:13:14+08:00March 16th, 2017|Categories: Uncategorized|Tags: gila babi, Hadi|Comments Off on Hadi is not an ignorant illiterate. His views are shared by many others, not all of whom are rural and less educated Muslims. He is more educated than most of his generation, including most of your fathers. REALLY?